Past passengers save $100 per person off select cruises. Free airport transfers and a discounted stateroom upgrade may also be available for customers who have sailed with AmaWaterways multiple times. Click here for eligible departures. Your journey begins with a three-night stay in picturesque Cape Town. 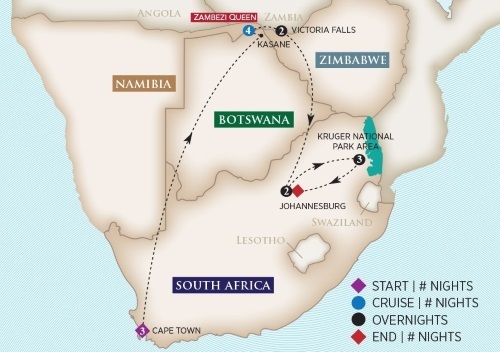 Next, fly to Kasane, Botswana to begin your Zambezi Queen safari cruise on the Chobe River. Explore Chobe National Park, home to one of the densest populations of wildlife on the African continent. Spend two nights at the legendary Victoria Falls before flying to Johannesburg for two nights that includes a visit to the township of Soweto. Then fly to Hoedspruit, located in the game-rich country of Greater Kruger National Park. Spend three nights at a luxurious game lodge in this premier eco-tourist destination, known for some of the best “Big Five” viewing in Africa. Experience the thrill of daily game drives, while evenings bring you breathtakingly clear skies. Dates, prices & itineraries are subject to change. Intra-Africa Air: $2,125 per person including taxes and fuel surcharges. Single Supplement: 50% of twin price for Cat. SB & SA; 100% of twin price for Cat. MS. Please see terms below for details. Visas are required for travel to Africa; please consult with your Consulate for more information.